her song is the arrival in Ponyville; the second is this. There is nothing remotely sudden about Twilight’s ascension. The top movie is Identify Thief, an alleged comedy. In the news, “We Are Young” by fun. featuring Janelle Monae, the only Billboard top song I have actually liked in the history of this blog, wins the Grammy for Song of the Year; North Korea conducts a successful nuclear test, prompting the EU to tighten trade sanctions; and the Large Hadron Collider shuts down for a couple of years for upgrades, after nearly five years of significantly advancing our knowledge of fundamental particle physics while not destroying the world even a little bit. Oh, and Twilight Sparkle is dead. For the length of one commercial break, anyway. Which is part of why, as I mentioned in the last article, this could not have worked as a two-parter. The only cliffhangers in the episode are at the end of the cold open and Twilight’s death, so the division would have to be at her death. This creates two problems. The more severe one is that, after the “Twilight’s been vaporized” cliffhanger is resolved, there is no conflict whatsoever for the rest of the effort–workable as an act-long detournement, not so much as an entire episode. But there is also the problem that we are dealing with a very young audience here, and leaving Twilight dead for an entire commercial break is bad enough. Doing it across the end of an episode and into the next one, or worse, still, across an entire season break? That’s just cruel–not so much because the kids will think she’s going to stay dead, as because of the tension of how she’ll be brought back. Because she is most definitely, unquestionably dead, sacrificed to restore the rightful destinies of her fellow ponies. She is burnt to a smear of ash in the shape of her own symbol, annihilated by the potent magical forces she has tapped in messing with destiny itself. She ascends to a dark and empty space illuminated by a distant light, the classic depiction of the liminal space between life and death, and there her entire life is presented to her by her mentor, now taking the role of a psychopomp. She is transformed, acquiring wings and a full-body halo of purple light. Pretty much the only thing she’s missing is the harp. And then she returns from beyond to establish her kingdom in the earthly realm. Behold: a Christ-figure, which is to say a sacrificial deity, which means it’s time to recall some foreshadowing I noted way back in the Season 2 premiere. The influence on pop culture came indirectly; George Lucas was a fan, and treated Campbell’s descriptive theory as a prescriptive framework, trying to hit every beat of the structure over the course of the original Star Wars. Before long, cribsheet versions of the Hero’s Journey were floating around Hollywood, and the structure became intimately tied to popular film, particularly the action-fantasy blockbuster model Star Wars helped create. From there, it has infested pop culture, a straightjacket which demands far, far more than their fare share of heroes need to be wide-eyed farm-boys (and it is almost always boys) or the modern equivalent, the working-class kid, whose wise old mentors die halfway through their conflict with a dark figure tied into the hero’s origins. This is not to say that the structure is inevitably bad or even that it’s inherently problematic that it’s widespread. Like it or not, the most popular religion in the world, the dominant religion for most of our culture’s history, is devoted to the worship of one of those Mediterranean sacrificial deities; the Hero’s Journey is going to show up a lot. And sometimes it’s used well in popular culture–Harry Potter is pretty decent until it flubs the ending, most of Buffy the Vampire Slayer is quite good; there are plenty of examples of it being executed well and plenty of examples of it being executed poorly, just like pretty much any structure. The problem is in its ubiquity and its prescriptive force; the Hero’s Journey has become the standard, and as a consequence it has become predictable and boring. But as foreshadowed by the Star Wars homage in the Season 2 premiere, Twilight is on just such a journey in the third season, although the highly episodic nature of the season (and probably also its short length) compresses that journey into the two-part premiere and the finale. As is often the case in serial works–and as Campbell himself noted is often the case with the Heroine‘s Journey–the result is a sort of spiral structure. Taking all three episodes as a unit, Sombra takes on the role of the Journey’s first challenge, the Threshold Guardian, who represents the protective parent who won’t let the child out into the world. Twilight’s conflict with him, however, contains within it a miniature Hero’s Journey in itself, with Celestia taking on the role of the Mentor, representing the parent as teacher, Cadence as the Goddess who provides protective gifts (in this case, keeping Sombra at bay until Twilight is ready to deal with him), representing the parent as nurturer, and Sombra as the Dark Father, the menacing figure connected with the heroine’s origin (in this case he is a villain defeated by her Mentor returned for revenge), who represents the necessity of rebelling against the parent to attain adult independence. Twilight sets out on the Road of Trials in a quest for the Crystal Heart, experiences a descent into the Belly of the Whale at the door which forces her to face her greatest fear, and then acquires the object of the quest and overcomes the Dark Father, taking a step out into the adult world. And yes, that is how the Hero’s Journey works: anything novel or unique to the story is stripped away so that it can be pulled apart, its bones neatly labeled and placed in boxes, each of which has a prescribed metaphorical meaning. It’s like TVTropes, if there were only twenty-odd tropes. And much like TVTropes, it can be an amusing diversion for an afternoon, but is more hindrance than aid to real analysis, and actively destructive as a guide to writing. Anyway, as Sombra was only really the Threshold Guardian within the larger story, Twilight has not yet proven herself, and a second cycle of the Journey begins, deploying a different set of the archetypal stages of the journey. Here, the Dark Father is notably downplayed, but nonetheless is clearly Starswirl the Bearded, the ancient unicorn whom Twilight sees as a role model, but whose spell has quite maliciously disrupted her friends’ destinies. (Note that each of them has quite possibly the worst possible job for their personality: Rarity must work outdoors, Rainbow Dash needs to be a caretaker, Fluttershy has to make people laugh at her, Pinkie Pie is forced to do constant chores entirely by herself, and Applejack is obligated to make the dresses she hates wearing). And that’s where, for those trained by TV and movies to expect the standard-issue Hero’s Journey formula, this all starts to feel wrong. If Twilight has accomplished her destiny, and completed the journey, what else is there? The formula is fulfilled–how can there be any more show after this? Twilight becoming an alicorn and a princess is series finale material, not a mere season finale with another season to come already confirmed! Won’t she have to leave Ponyville to take up whatever her new duties are? Won’t this unbalance the friendships of the Mane Six that are the core of the show? From that perspective, this is a narrative collapse, a direct challenge to the ability of the story to continue. Yet the episode itself takes great pains to assure us that no such collapse has occurred. There is no conflict after her transformation, just celebration, a coronation and an assurance that “Everything’s going to be just fine!” How can this be? The Hero’s Journey is, supposedly, a metaphor for adolescence, for leaving the safety of childhood, acquiring skills and learning one’s destiny, pulling away from the guidance and protection of one’s parents and establishing oneself as an adult. This is supposed to be the universal story, the monomyth–but life doesn’t end at 20. It’s barely begun. The problem with treating the Hero’s Journey as the only story–or, rather, one problem among many–is that it robs children and adults of all their stories, and creates a culture in which adolescence is the only narrative. You may have noticed a glaring omission, verging on outright lie, in my description of “The Crystal Empire”: Twilight didn’t defeat Sombra. 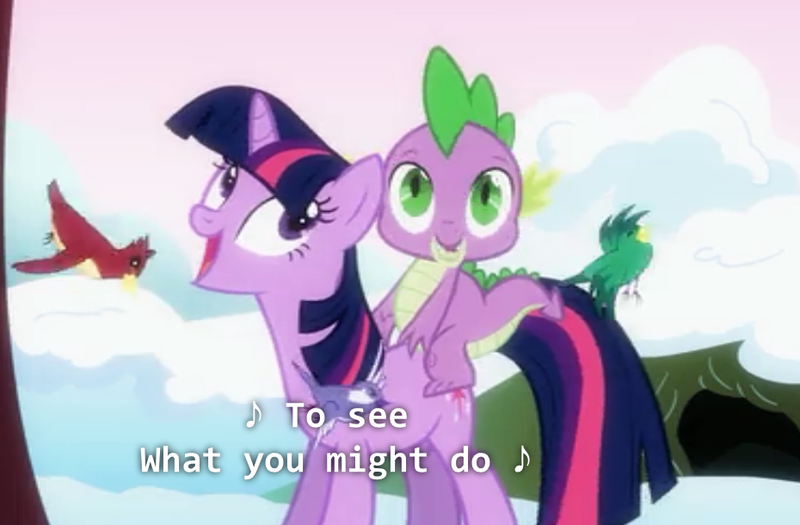 Spike did. Indeed, the entire point of the test Celestia set Twilight to complete was for her to learn to lead rather than try to do everything herself, to let others act when they are in a better position to do so. The Hero’s Journey is all about the hero becoming independent, shaping their own destiny–precisely what Starswirl tried to do with his spell. But instead Twilight shows her friends how to help each other recover their lost destinies, and then they help her open the path to hers. The mistake in Starswirl’s spell was in treating destiny as something that he creates and completes himself, but it’s not. Oh, each person does define their own destiny, that much is clear. Given the same cutie mark, Rarity embraces a destiny as a weather manager, while Rainbow Dash maintains weather management as her day job and pursues a destiny as a racer and stunt flyer. That’s the diegetic reason so many background ponies have the same handful of cutie marks–even if they look identical, they are still different destinies because the ponies that bear them are different, and thus necessarily interpret them differently. But no one achieves their destiny alone. Everyone has caretakers as a small child; the Hero’s Journey reduces parents to archetypes, but they’re not. They’re people. The companions met on the path are not The Companions Met on the Path, to be placed in a box and labeled; they are individual and unique people to be related to. The Hero is not the only one on a Journey; never forget Lesson Zero, that everyone is the main character of their own story. “Everything is going to be just fine” because the Hero’s Journey is not the monomyth. There is no monomyth, no magical formula to crafting Story, which is far too large and wild a thing to be pulled down and trapped in little cages. Season Three has flirted repeatedly with the formulaic, from the Return of Fan-Favorite Rival to the Very Special Episode, from the Parody of a Popular Movie from Decades Ago to the sitcom flailing of the four episodes prior to this finale, and at first glance “Magical Mystery Cure” is just as formulaic. But it is also a denial of the formula, a declaration that there is story to be found beyond this and every other formula. Season 3, especially toward the end, showed serious signs of illness. The show seemed to be losing its magic. It needed, desperately, a cure, a restoration of magic–and this episode delivered precisely that, by adding precisely what the show, by becoming increasingly formulaic, was losing: mystery. After this episode, it is impossible to say what the show will do next. What could be better than that? ETA: “Du jour,” Froborr, not “de jure.” Kind of a bit of a difference in meaning, there. The penultimate episode of Sailor Moon's first season infamously ended with nearly everyone but the title character dead – and that show was aimed at a similarly young audience. Sorry, but that's just not true. Sailor Moon had a target demographic of girls 10-18. MLP's is girls 3-8. That's a HUGE difference in maturity between the youngest kids MLP is for and the youngest kids Sailor Moon is for. Well said, Froborr, well said. I was terribly curious what you were going to do with the 2nd half of this, and you knocked my socks off! Thank you kindly, good sir! I wasn't really entirely sure what I was doing with it myself, because while I could explain why MMC is a great episode, I wasn't sure that I could explain my feeling that it saved the series. But then I started thinking about how last week I abandoned my usual (fairly loose) formula for these entries in favor of a different, rather stricter, formula. Then it clicked. And that's where, for those trained by TV and movies to expect the standard-issue Hero's Journey formula, this all starts to feel wrong. If Twilight has accomplished her destiny, and completed the journey, what else is there? The formula is fulfilled–how can there be any more show after this? Twilight becoming an alicorn and a princess is series finale material, not a mere season finale with another season to come already confirmed! … Yet the episode itself takes great pains to assure us that no such collapse has occurred. There is no conflict after her transformation, just celebration, a coronation and an assurance that “Everything's going to be just fine!” How can this be? Technically, when they made this episode, the show hadn't yet been renewed for a fourth season (everyone was saying that the show was only going to the dreaded 65-episode mark, and it may well have been, if not for the fact that several of the Hub's other new shows didn't take off as well as Hasbro had hoped, so they took the safer bet). So, this episode had the very unenviable task of working both as a season AND series finale. Hence why Celestia's Ballad has such a “goodbye” tone and feels like a summation. I've just been pointed to this after having my own rather more ranty rant about the hero's journey and… I can't articulate my thoughts clearly, but I feel you've touched on a many of the points I was trying to make and done so in a much clearer and far more lucid manner. I wonder if you've read the Film Crit Hulk's thoughts on the matter at all? There's a persistent, low-level backlash against the hero's journey out there but for some reason people keep acting as if it's the only structure worth using. Interesting. Do you have a source for this? I've read some of Film Critic Hulk's other rants, but not that one. It was good! I generally like her stuff, but I find it very difficult to read large blocks of all-caps text, so I don't follow her regularly.